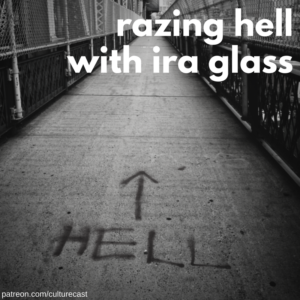 In this episode of the CultureCast, Amy gets to share some big news about her new position in Texas, and Christian gets his nerd credentials boosted by Ira Glass. Amy and Christian look at the state of leadership in the church today. what does it take to truly lead the church in the 21st century? what does society need from a faith leader? how do faith leaders best care for people today? how do you lead people in something that doesn’t allow for certainty? and what about when you feel compelled to lead in a direction that you know will not be welcomed? Up first, Christian interviews Amy in a pre-interview interview about what it takes to be a leader, the challenges of leading people who are leaders in other contexts, the problems with and tensions of being welcoming, and the lure of certainty. Then, Christian talks with Ira Glass about his movie Come Sunday, now available on Netflix. From IMDB: Based on an episode of the public radio series This American Life, which centers on Bishop Carlton Pearson, a rising star among evangelicals until he was ostracized by his own church and declared a heretic after he started preaching that there is no Hell. have Christians gotten gotten a bad rap? have they earned that portrayal? is God a God of love, or of wrath? The very first episode of the Surviving the Bible podcast is out! You can listen to it here. Make sure to subscribe and share. Christian will be doing a live podcast in Chicago this Wednesday, April 18th. You can get more info and tickets here.